Hi all! I got back from Mallorca on Friday, but I've got one more guest post for you from my lovely intern Lauren, so I could fully commit myself to being incoherently jet-lagged this weekend. If you haven't had a chance to read the other guest posts by dietetic interns that I shared while I was gone, be sure to check out "What it's Like to be a HAES-informed Intern and "How to Eat Intuitively on Vacation," also by Lauren, "Let's Put the Diet Industry Out of Business" by Natasha, "Discovering Body Gratitude" by Christyna, and "Bursting the Health Bubble" by Taylor. And be sure to follow them all on instagram for more Intuitive Eating and Health at Every Size inspiration! Like a lot of people, intuitive eating didn’t make sense to me at first. The thought of letting myself eat “whatever I want” totally conflicted with not only the diet culture I was socialized in, but also with the guidelines and values instilled in me as a dietetics student. 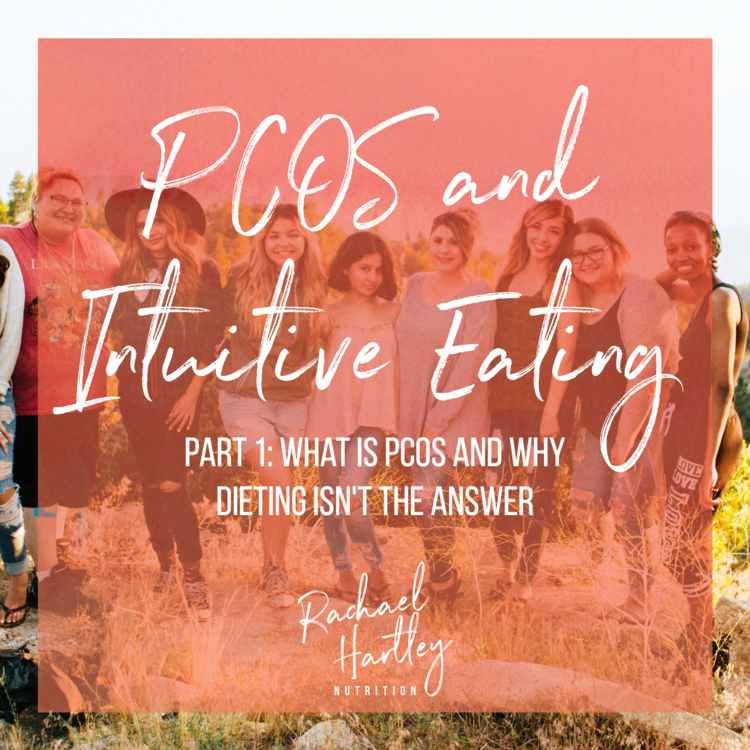 Additionally, as someone with chronic autoimmune disorders and celiac disease, the language surrounding intuitive eating didn’t resonate with me. Trust your body? That was not something I believed I was capable of. Living with celiac, I learned that my body was not to be trusted or relied on in any way, especially around food! Respect your body? My body was constantly freaking out. Constantly breaking down on me. That didn’t feel like the kind of behavior that warranted respect. Ditch the rules? Heck no!! Like any other food allergy, celiac requires rules and boundaries: where to eat, what to eat, where to draw the line on possible cross contamination, what to say, things I needed friends/roommates to do, etc… Rules kept me safe and healthy. Birthday ice cream from my fave place in Austin that has GF cones! Some of the language around intuitive eating is still frustrating to me, and doesn’t resonate with my experiences with chronic illness and food allergies. But somewhere along the way, the power struggle between my brain and my body hit a breaking point, and it clicked that intuitive eating was the key to resolving this power struggle. I realized that intuitive eating was about nurturing a better relationship with my body, and I realized that trusting my body doesn’t mean I can or should expect it to do everything right all the time. Rather, trusting my body means that I can rely on my body to communicate with me and tell me what’s going on. I want to be clear that intuitive eating with a medical issue or food allergy doesn’t mean you should eat a food that is legitimately harmful to your body. And I also want to be clear that I’m not talking to people with self-diagnosed intolerances, food avoidances, or those attempting elimination diets. Those three things fall into a very different category that I won’t get into here (but you can read about here). “Gluten free”, although still medically necessary, has been reframed from a restriction to an act of self care. Shifting away from the restriction mentality has removed me from the restrict binge cycle. This cycle is commonly associated with dieting, but can come from any form of restriction, even medically necessary ones. Connecting with my body and really tuning in to what’s going on has helped me realize that I actually don’t need to be avoiding additional foods! You can barely breath the words “autoimmune disorder” without getting bombarded with food intolerance information. Subsequently, I spent way too much time thinking maybe I had additional food allergies or intolerances… Turns out I feel just fine when I eat most of those things (something I wouldn’t have known if I wasn’t able to tune in with my body to hear it!) And the times I don’t, I can usually pin point the other factors causing me to feel off: usually something related to anxiety, cross contamination, stress, how much activity I’ve gotten recently, or where I am in my menstrual cycle. Overall, IE has helped me feel significantly less stressed and anxious around food. It’s no coincidence that my GI distress has significantly improved in correlation with my relationship to food. Anxiety and stress alone—for any reason—can totally mess up your GI tract! And when you have to feed yourself multiple times per day, and worry about what you can/should/will eat each time, and then sit in classes and learn about nutrition and food all day… well, that stress adds up real quick and can flip anyone’s stomach, even without GI disorders. If you have some kind of food allergy or medical condition that makes intuitive eating seem impossible, I hope this gives you hope and makes you feel less alone!